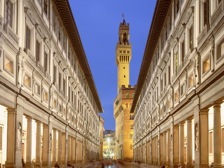 The Uffizi gallery in Florence is one of the most tiring museums in the world. You expected me to use another adjective? famous? important? Sure, it’s those things too. But it’s also very big, has virtually no benches to sit down, and crowded (just about all the time). 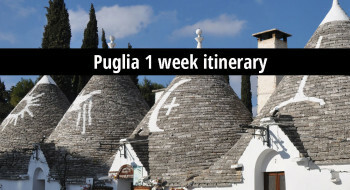 Just walking through at a normal pace, it takes three hours to get through, and then you wonder “what did I see?”. 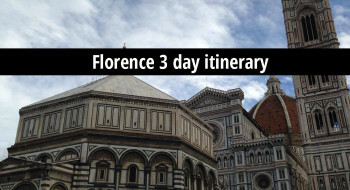 All that is going to change if you follow my Uffizi Art History Guide – Unanchor Travel Guide – an inexpensive kindle ebook. Below is an earlier version (and inspiration) of this guide. 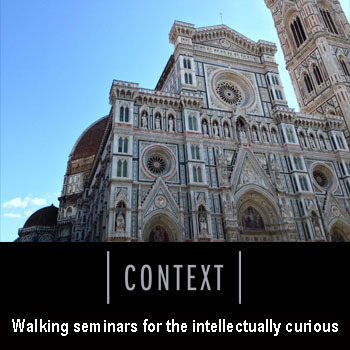 When I use to take university students to the Uffizi or assign an independent visit to them, I used to give the a list of works that I wanted them to make sure they saw. I’m giving you a map with the room numbers (subject to change as the gallery has been undergoing renovation in recent years), a list of important works, and some questions to ask yourself in front of each. This is best done with a friend or two – talking about art, in front of art, is the best way to learn. 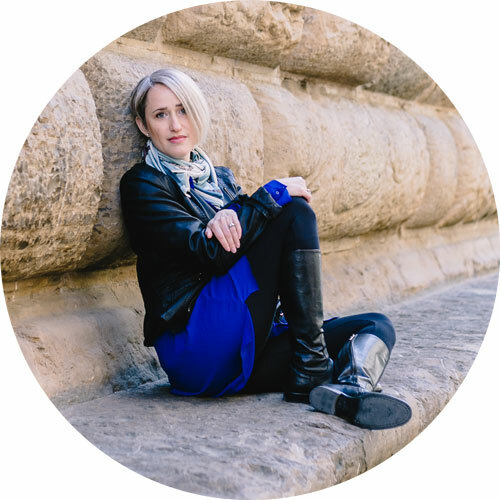 At the risk of sounding like an infomercial, let me tell you that if you follow this method, you will come out not too exhausted, and you will have learned something too. 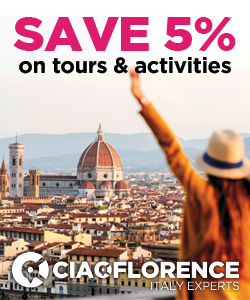 PLEASE NOTE: this guide is pre 2012 does NOT cover the newly added sections of the Uffizi Gallery. 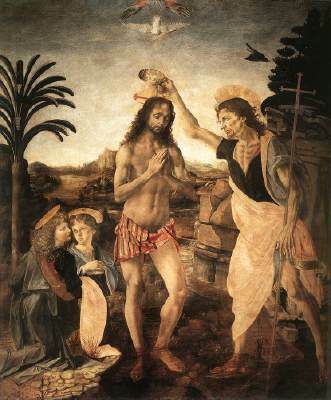 1) The Renaissance consists of mostly religious works of art, until you hit the Botticelli Room. Try to identify the stories and protagonists in these pieces. How are stories COMMUNICATED to the viewer? Is there a clear narrative in these works? How do you know – or not know – what is going on? 2) Thematically, start thinking about comparing works a) between different periods or artists; b) of the same subject matter. Look closely at, say, two “Annunciations” or two portraits, and think about their similarities and differences. Room 2: Giotto, Cimabue, and Duccio: Please look carefully at the three large altarpieces in this room. Take the time to compare them and start to see the differences between them. Which one do you think was done latest? Which one best expresses depth and the human form? Room 5-6: International Gothic. Looking at the two largest works in this room, Lorenzo Monaco’s Coronation of the Virgin and Gentile da Fabriano’s Adoration of the Magi (1423) – what do you conclude are the characteristics of this international gothic style? Room 7: the first renaissance painters: Paolo Uccello, Battle of San Romano (1430s), Masaccio’s tiny Madonna and child, Masaccio and Masolino’s Madonna and Child with Saint Anne. Do you start to see any progress in the depiction of space and/or emotion? How do these differ from the International Gothic pieces that are close contemporaries? 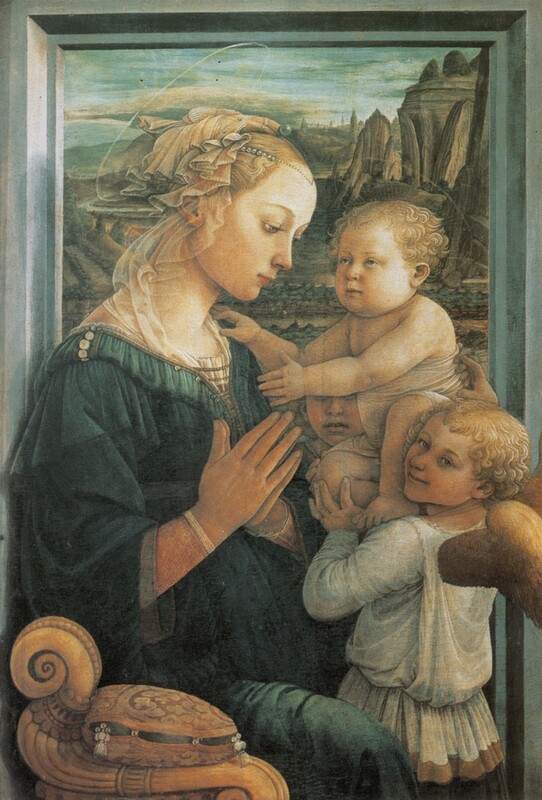 Room 8: Lippi room: Filippo Lippi, Madonna and Child with Angels: consider the tenderness of expression, look at how volume is heightened using a black outline (Lippi taught this trick to Botticelli). Piero della Francesca, double portrait of the Duke of Urbino and his wife: what can you guess about gender differences in this period, just by looking at this painting? Whose world is more closed, and why? Room 9: Pollaiuolo. Please look at the teeny tiny panels of Hercules on display in a glass case. These are some of the first highly anatomic studies of the renaissance. Room 10-14: The big Botticelli Room: In class we will study Botticelli’s Primavera, Birth of Venus, Mystic Nativity, Madonna del Magnificat. Also of interest, all the religious paintings by Botticelli; the large Northern Renaissance Portinari Altarpiece by Hugo van der Goes. Room 15: In this room you’ll find Leonardo da Vinci‘s Annunciation, the newly restored unfinished Adoration of the Magi (examination reveals how he planned and built up painting); the early Baptism of Christ with his teacher Verrocchio (guess which part Leonardo did here). Also in this room, paintings by Perugino. Hallway: The route now forces you out to the hallway. Check out the “grotesque” decorations on the ceiling and the hallway lined with ancient and modern sculpture. This is an interesting arrangement but for the general viewer you don’t need to stop to look at any of these things in detail. 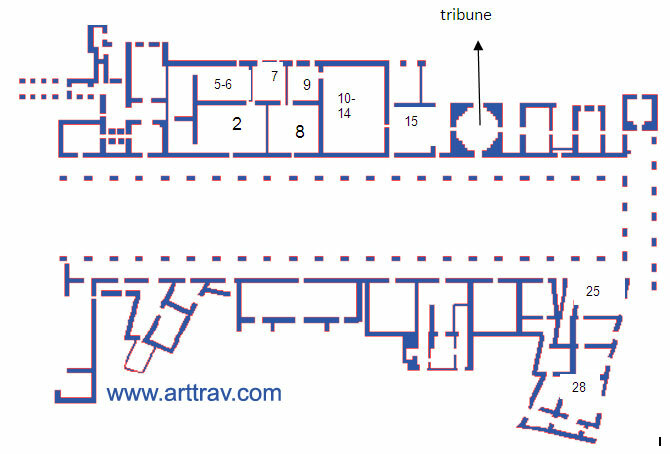 On your left there is a room called the Tribune that you can peek into through three of its entryways. From the hallway check out the view of the Arno and the Ponte Vecchio, go around the corner and head to room 25. 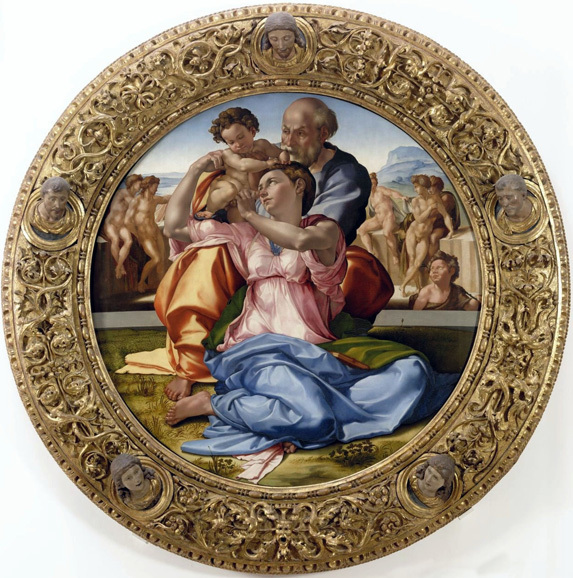 Room 25: Don’t miss Michelangelo’s Doni Tondo: think about the position the figures are in – is this natural? That is an original frame, incidentally. Room 26-27: Raphael and the mannerist artists Andrea del Sarto, Pontormo, and Rosso Fiorentino: how do Raphael and his school construct portraits? His contemporaries said he did everything with such ease you could not see the art in it. 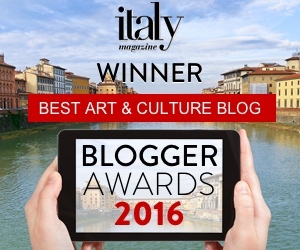 Room 28: Titian and Venetian art. Observe the languid pose of Titian’s Venus of Urbino (who is she waiting for? Her husband or her lover?). Consider how the Venetian style (and subject matter) of the early Cinquecento is different than Quattrocento Florentine style; look closely at the handling of paint. Room 29: Parmigianino’s Madonna of the Long Neck is the most famous example of the Mannerist style. It is slightly unfinished, can you see where? Notice the elongated shapes of womens’ bodies; these are compared to the vases that are so prominent in the painting. As you follow the path to the exit, there are rooms set up for special exhibits. 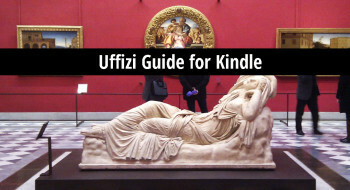 If you found this article helpful, please let me know by writing a comment or purchasing the much expanded Uffizi Art History Guide on amazon to follow along in the museum.